Last summer, nine former Chinooks began personal journeys into professional baseball. Today we’ll begin a three part update on their rookie seasons after being drafted or signed in 2017. After a sensational season for Louisville in which the Cardinals reached the College World Series, Fitch was selected in the 13th round of the MLB Draft by the Philadelphia Phillies. The hot-hitting catcher connected for 11 home runs and 47 RBI while starting 62 games during junior season and went 4-for-12 with a double and four RBI in the CWS. After signing his contract and forgoing his senior season, Fitch got his first taste of professional action with stints in Class A Williamsport and with the Class A Lakewood BlueClaws. Colby hit .266 in 34 games between the two teams with four home runs, four doubles, and 12 RBI. A homegrown pitcher from Franklin, WI and one of the top pitchers for the 2014 NWL Champion Chinooks, Kruczynski graduated as the ace of the East Carolina staff and was promptly drafted in the 9th Round by the St. Louis Cardinals. 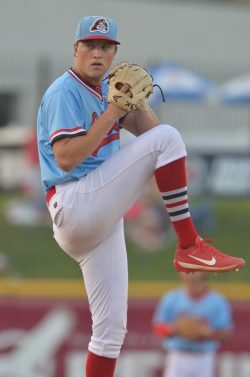 Kruczynski, who earned All-America honors as a junior and finished his career with a 20-8 record, left ECU as one of the top pitchers in ECU history and got off to a solid professional start with a 4-3 in 13 starts for the Class A Peoria Chiefs. The tall lefty stuck out 55 batters in 68.2 innings and posted a solid 3.41, a good start to what looks like a promising future! After a solid season for the Chinooks in 2015, Zac Lowther turned the heads of professional scouts when he led Xavier to the 2016 NCAA Tournament and an unexpected win over national power Vanderbilt. The lefty went on to rack up honors for XU and helped power them to the 2017 post-season before being selected by Baltimore with the 74th overall pick in MLB’s First Year Player Draft, making him the highest-ever draft pick in Musketeers baseball history. 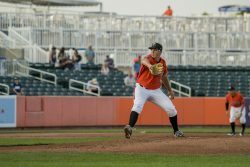 Lowther began his career earning with a New York-Penn League All-Star performance for the Aberdeen IronBirds in which he posted a 2-2 record with 75 strikeouts and a 1.66 ERA in 54.1 innings and 11 starts for the Orioles’ Class A affiliate.